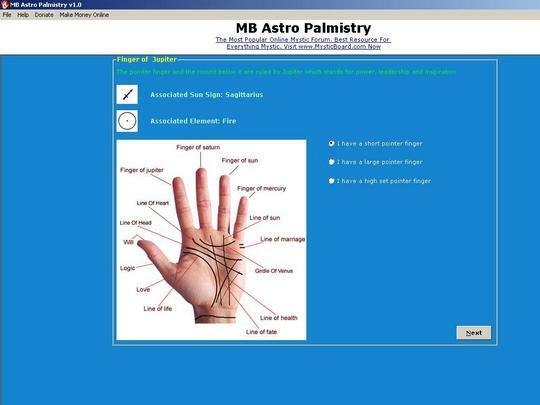 MB Astro Palmistry is an unique software that combines the knowledge of astrology and palmistry to add new conclusions about the lines on your palms. Know the astrological meanings of the shape of your hands, fingers and lines of your fingers instantly with MB Astro Palmistry. Astrology is nothing but the study of the correlation between the positions and the movements of the planets, the stars and other celestial bodies and events on earth. It is the firm belief of the astrologers that the placement and the movements of the heavenly bodies - the Sun, Moon, and the nine planets of the galaxy, at the time of birth of an individual have a direct influence on his/her character.